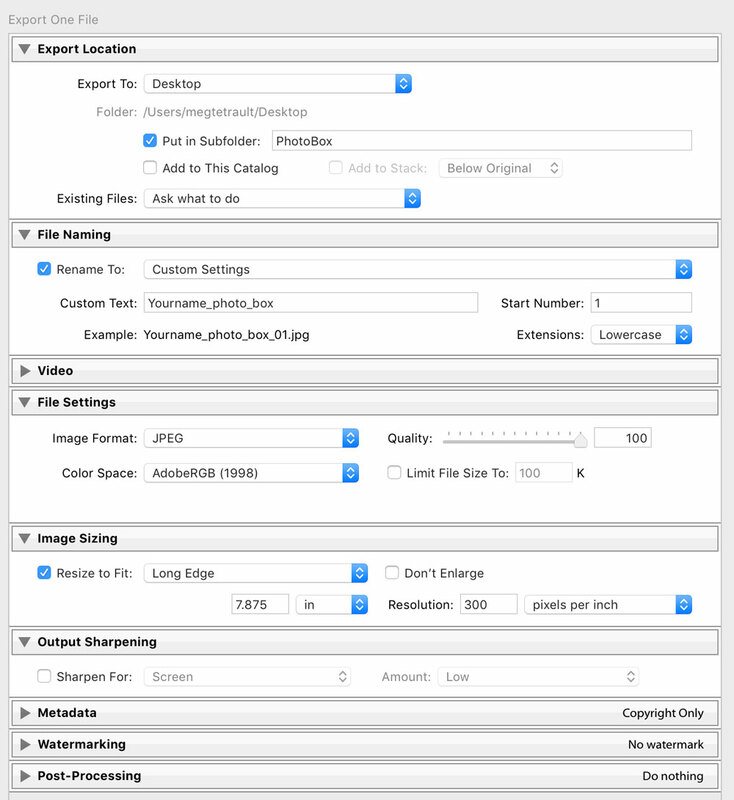 How to prepare a file for the Custom Image Photo Box full-bleed print option. Preparation is key. Don't hold your order up with incorrect file requirements. For the Custom Image Photo Box full-bleed print option, preparing the file properly ahead of time will keep your order moving through the production process and from getting held up. Cropped to 7.875" x 5.75"
If you have any questions or need help, don't hesitate to reach out on our live chat or email at cs@photoflashdrive.com. Read on for instructions and tips when using Adobe Lightroom or Adobe Photoshop. 1. Select an image and click over to the Develop module. 2. In the right panel, choose the Crop Tool. 4. 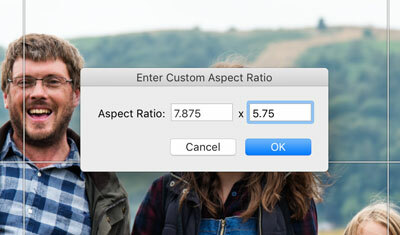 In the dialog box, enter the aspect ratio: 7.875 x 5.75 (as seen below). 5. Position and modify the resulting crop window to your liking. 6. 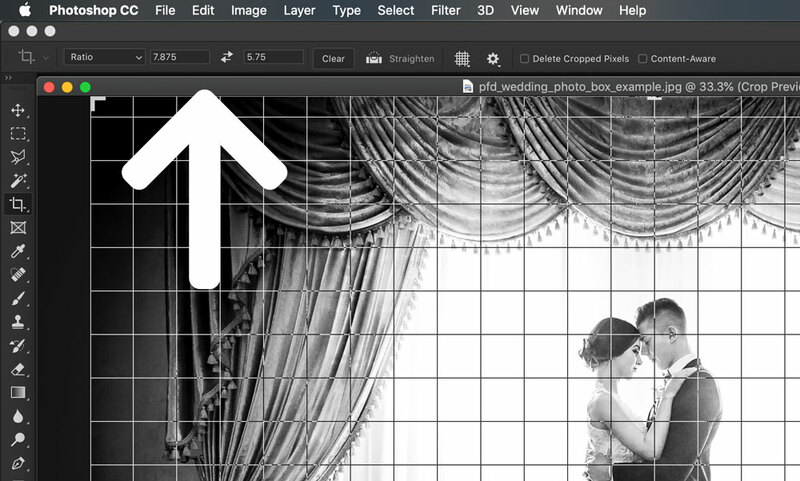 Click back over to the Library module and, with the image select/highlighted, choose 'Export'. 7. Follow the below example to fill in the Export Settings. The File Settings must be set to JPEG, Adobe RGB, 100 quality. The Image Sizing must be 'Long Edge' at 7.875 in. at 300 resolution. 8. Export the file and upload it to the Custom Image Photo Box customizer when choosing Full-bleed print. Open the image you'd like to use into Photoshop. 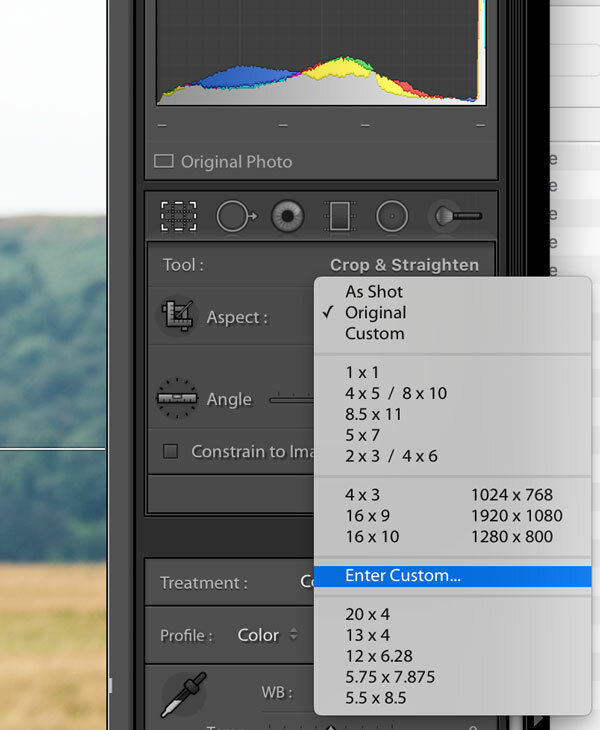 Using the crop tool, set the ratio to 7.875 x 5.75 (seen below). Position the crop to your liking and commit the crop. Pro tip: uncheck the 'Delete Cropped Pixels' option in the toolbar. 3. Go to Image>Image Size and adjust the settings as seen below: width 7.875", height 5.75", resolution 300. Click OK.
4. Finally, select File>Save As... Name your image with your name and some type of descriptor for your reference--e.g. JohnSmith_photo_box.jpg. Choose the 'JPEG' format and then Save. When the JPEG options appear, set the quality to the highest (12) and click OK.
That's it! Whether you're using Adobe Lightroom or Adobe Photoshop, you're now ready to upload your image for your new full-bleed Custom Image Photo Box.